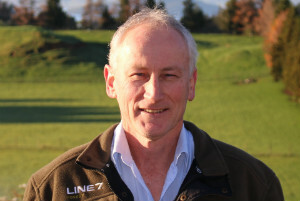 Nick Saville-Wood and Cushla Hossack have a 22 hectare sheep and beef farm just north of Rotorua. In this video, Nick talks about phosphorus and how he’s working with other landowners and scientists to reduce surface runoff phosphorus losses on his farm. Nick Saville-Wood and Cushla Hossack have a 22 hectare sheep and beef farm just north of Rotorua. Today Nick talks about phosphorus and how he’s working with other landowners and scientists to phosphorus runoff from his farm. Cushla and I moved to Kaharoa in 2010. We both work in town so we need to run a system that fits our busy lifestyle. Our mainstay is a herd of steers we buy at 18 months old and sell when they reach target weights at 2½ to 3 years old. We also have a mob of Dorper sheep with self-shedding wool. Even though our farm is pretty small, we still need to tackle our nutrient losses, just like larger farms. The main environmental challenge at our place is dealing with surface runoff. We average about 2.4 metres of rainfall each year. Despite the free draining pumice soils, we get multiple runoff events during intense rain. Our farm has a major ephemeral or temporary waterway that carries runoff from several neighbouring farms as well our own. This runoff has damaged our main farm track and the nearby state highway. About four years ago, we met with the regional council and the Transport Agency and agreed to build a detention dam to slow down the runoff. The dam works OK but drains in a few hours. This is too quick to allow the phosphorus and fine sediments in the runoff to settle out. We’re now looking at modifying the dam outlet structure so it can hold ponded water for up to three days – any longer and it will start killing the grass. This system is known as a ‘detainment bund’. We’re involved with a local project on how to make the best use of these bunds. A research trial at our neighbour’s farm is measuring phosphorus flows in and out of their detainment bund. The data from the three-year trial will quantify the benefits of this mitigation system. On our farm, we reduce the phosphorus losses by keeping cattle away from the ephemeral stream in wet conditions. If that ground gets pugged, a lot of sediment and phosphorus can get carried away in storms. When it’s pouring, we stand the stock in our pine block which was recently harvested. We make sure we keep any minor ephemeral flow paths as broad as possible because that helps slow down the runoff. A series of cut-off drains along our main track deflects the water sideways. This limits the volume of run-off, reduces erosion and allows the pasture to filter out sediment. Our place used to be part of a larger dairy farm and the soil Olsen P levels were quite high when we bought it. We held back on phosphorus fertilisers until the levels dropped. For our farm, the optimum Olsen P level is about 25 units. Regular soil testing helps us make our fertiliser decisions. Now we just apply the maintenance rates of fertiliser. Phosphorus mitigation is all about finding a combination of practices to suit your farm. We’ll keep working with other farmers to test and fine-tune new practices that will work here on our farm. Lowering soil Olsen P levels will reduce phosphorus runoff, with OVERSEER indicating a decrease from 1.7 kg to 1.4 kg of phosphorus per hectare per year. Further decreases will occur until the optimum soil Olsen P level is reached. Maintenance P fertiliser will then be needed to maintain fertility and production. Managing critical source areas, like putting cut-off drains on tracks, will also significantly reduce farm phosphorus losses. The saving in fertiliser costs during the period in which reduction in soil Olsen P is assumed to occur. In the “mining” phase, the economic benefit is essentially the difference between what is being applied (currently 3kg P/ha/year) and the maintenance requirement of the target soil Olsen P level (39kg P/ha/year). At the current price of applied superphosphate, the annual cost saving while P levels are being mined for the property is $149/ha/year. The ongoing savings in fertiliser from a lower maintenance fertiliser requirement at the lower levels. There are production risks related to undershooting the optimum soil Olsen P levels. This risk can be reduced by regular and consistent soil testing, and reviewing the farm’s P fertiliser inputs and production levels (actual and targeted). Some of the critical source area mitigations require ongoing management (e.g. pre-emptive shifting of stock away from the ephemeral watercourse) and/or ongoing maintenance (e.g. cut-off drains). Without ongoing vigilance, the efficacy of these CSAs would diminish. Ballance is developing a spatial ‘decision support tool’ called MitAgatorTM – this has a strong focus on managing critical source areas. Prior to its public release, you can read about the science behind MitAgator here.